Peter Daniels, a Republican, represents Los Santos in the State Senate. In a few weeks, the State of San Andreas will face elections to choose the new members of its legislative and executive branches. On one side of the political arena we have the Republicans, who have dominated the scene for most of the last term. On the other, the Democratic Party, which after a rather disappointing turnout in the last elections have seemingly managed to recover and now promise to sweep the State with their "blue wave". If you are someone who is not very interested in politics, someone who knew what the Legislature was discussing but never paid too much attention to it, someone who heard the Governor had signed an executive order but never took the time to check its contents, it would be easy to chalk this election down to a simple, easy choice between left and right, between liberals and conservatives, between Republicans and Democrats, like many times before. Except this time it's not. The last term was one of the most unproductive ever in the history of San Andreas, with a record low in legislators' attendance to discussions and a record high in missed votes. In multiple cases legislation did not pass not because of a majority of members of the Legislature voted against it but because there was no quorum, meaning that not enough legislators attended the vote. Republicans, with their supermajority and absolute control of the chambers, are the ones who obviously have the highest number of missed votes. This is a fact which only makes it more ironic when you consider that it was members of the Republican Party who, earlier this year, impeached Senator Douglas Chamberlain claiming that, among other things, he had "purposely delayed Senatorial proceedings for their own egotistical desires" and had "not acted out his duties in a committee and delayed its proceedings". Chamberlain, whose behavior in the chambers was fairly questionable — but not unusually so compared to other members of the Senate, both past and present — had missed zero votes at the time of his impeachment. During the same period, Senator Audrey Silva and Senator Fujiro Yamanouchi, both Republicans, missed four and three votes respectively. What gives the entire scenario an ironic twist, that actually isn't very ironic, is that the Majority Leader of the Republican Party was seriously concerned by the lack of attention Mr. Chamberlain had for the Senate, but at the same time failed to notice that of her own party members. The case of Douglas Chamberlain is a good representation of the priorities and the goals that much of our legislative branch pursued throughout the last term. With our supermajority, the Republican Party had the unique opportunity of turning the fate of our State around, provide an answer to questions that have gone ignored for far too long and find innovative solutions to resolve issues that have been affecting the citizens of San Andreas for years: a more balanced budget, more oversight on public agencies, actual programs to reduce the violence in our streets. We could have made it. Instead, in a dangerous harmony with what the Republican Party is becoming national level, we, too, chose to use that supermajority to chase personal vendettas and special interests that have no place in the halls of the Legislature. But, of course, the Republicans are not the only ones to blame for the situation of San Andreas. The Democratic Party struggled to recover after the setback they experienced in the last ballots, which left them with only a fraction of the numbers they used to have in the legislative branch, but didn't stop them from securing one of the highest positions of the executive branch, with Carl Duncan obtaining the seat of Lieutenant Governor during the last elections. Throughout their term, the Governor, Wade Reynolds, and the Lieutenant Governor, Carl Duncan, showed a suspiciously similar affinity to those Republicans who achieved a record low number of presences. In his defense, it can be said that the State of San Andreas that Reynolds and his team inherited from his predecessors was not in the best of shapes, and a large amount of blame for that falls, once again, on the very party I'm a member of. Former Governor Lauren Isley, for example, is fondly remembered among the personnel of the Department of Corrections for her decision to cut funds to an already underfunded state agency that was and still is vital to the safety of San Andreas. The same goes for Former Governor Larry Rauner, who is more known for the lawsuit that pitted him against former state employees claiming to have been fired unjustly than for the improvements he made to San Andreas. But while Reynolds promised to turn things around once Governor, he just kept following the same path as his predecessors and possibly managed to reach new heights in terms of lack of cooperation between the executive and legislative branches, to the point that one vetoed legislative item was returned to the Legislature without even having the usual veto message attached. And aside from a minor reorganization of the Department of Corrections, which still is to show its much announced improvements in terms of effectiveness, and the shake-up of public-private ventures with the introduction of a revamped system of government contracts, Governor Reynolds and his cabinet have really little to show for their time in office. If we look at the political situation of San Andreas under this light, which clearly shows how both parties have their responsibilities in bringing the State where it is now, it doesn't take much to see that no, the next elections won' be a simple, easy choice between Republicans and Democrats. The upcoming elections will be a choice between those who care and those who don't. Between those who will use the powers they're given to attempt to improve the lives of the citizens of San Andreas and those who will use them to run after personal gains and settle personal disputes. Between those who, once appointed, will try and tackle the issues that have been affected us for far too long and those who will sit and watch. Between a San Andreas that looks forward and one that stands still, paralyzed by legislative and executive inaction. Obviously, only one of these choices will put us on the way to bring our State back to the full potential it once had. Having dedicated, resolute people in the legislative and executive branches of our government, regardless of their political affiliation, it's how that way starts. And the next elections are a good time to start. Disclaimer: The views expressed in this op-ed do not reflect those of the Los Santos Times or the San Andreas Network editorial boards. 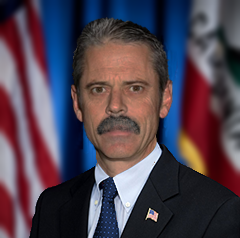 Peter Daniels currently serves as State Senator, representing Los Santos. A former police officer with the Los Santos Police Department and correctional officer in the San Andreas Department of Corrections and Rehabilitation, Daniels served as law enforcement officer for more than thirty years before entering politics. He is a three-time recipient of the Correctional Meritorious Service Medal. Last edited by Ulysses on Sun Dec 16, 2018 11:15 pm, edited 2 times in total. Comment: Well done - #FakeNewsNina is out. Action number 1 in the new session: Repeal the Silva Act.